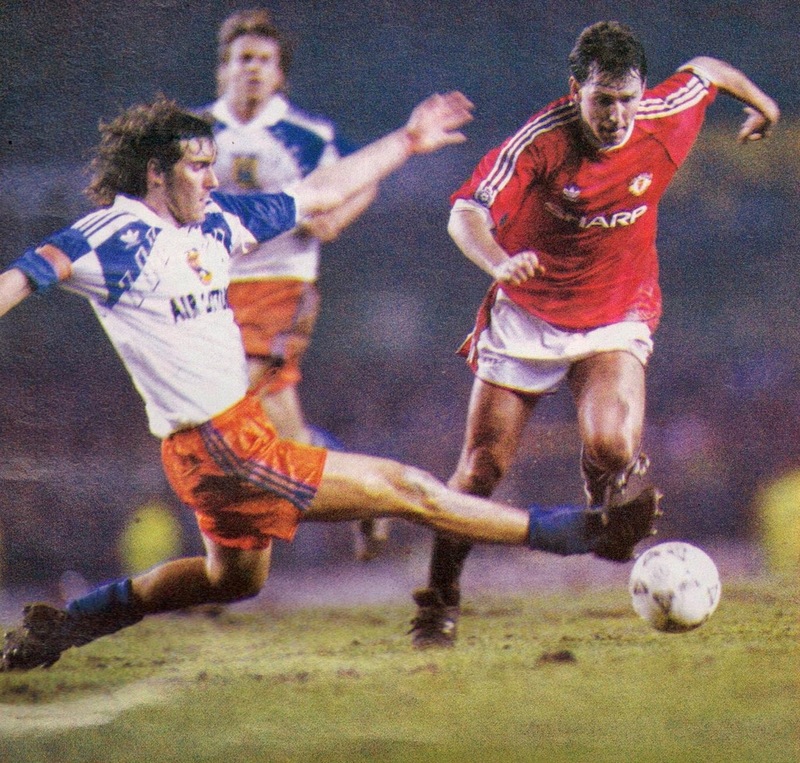 Manchester United and Montpellier were paired in the Quarterfinals of the 1990/91 Cup Winners Cup. The English Club Manchester United, managed by Alex Ferguson, were along with Aston Villa, the first English clubs to play in Europe after the Heysel ban in 1985. 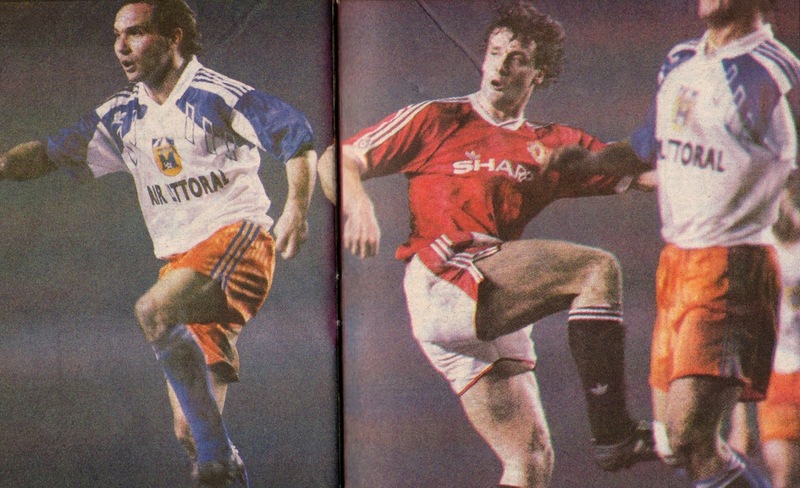 They were led by the injury prone skipper Bryan Robson and contained players such as Irish defender Dennis Irwin, Welshmen Clayton Blackmore and Mark Hughes, Scottish forward Brian McClair and solid reliable defender Steve Bruce. They had qualified with relative ease from their opening two Rounds. The Hungarians of Pecsi were defeated home and away (2-0 and 1-0 respectively), and Welsh squad Wrexham were also defeated home and away (3-0 and 2-0 respectively). They were lagging behind in the League and Europe was their only chance for any silverware. The little known French side of Montpellier was the surprise team of the Tournament. They were a mid-table team in the League, but still contained many talented players. The team was managed by the Polish Henryk Kasperczak and was led by skipper and rising star Laurent Blanc. The foreigners on their books were Colombian star Carlos Valderrama, Dutchman Wilbert Suvrijn and Polish Striker Jacek Ziober. They had surprised everyone by eliminating in the first two rounds, two recent former European Champions, the Dutch powerhouse PSV Eindhoven (1-0 Home, 0-0 away) and Romania’s Steaua Bucharest (5-0 Home, 3-0 away). The first leg, on March 6th, was played at Manchester’ Old Trafford Stadium. 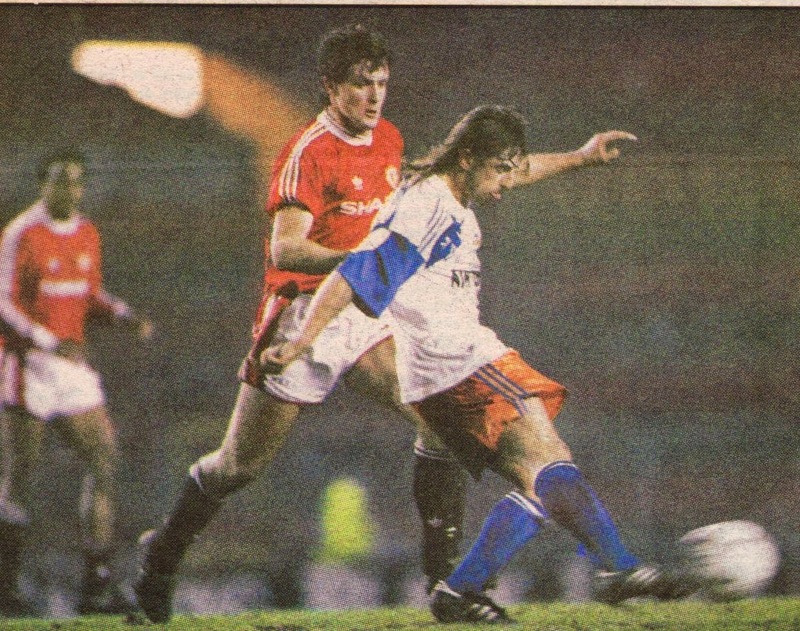 Manchester United were missing regulars in defense through injury: Steve Bruce and Dennis Irwin. In their place Lee Martin and Mal Donaghy started. International midfielder Neil Webb was also missing through injury. Montpellier were missing Carlos Valderrama and naturally adopted a defensive set up for this away match. Manchester United scored right at the first minute. 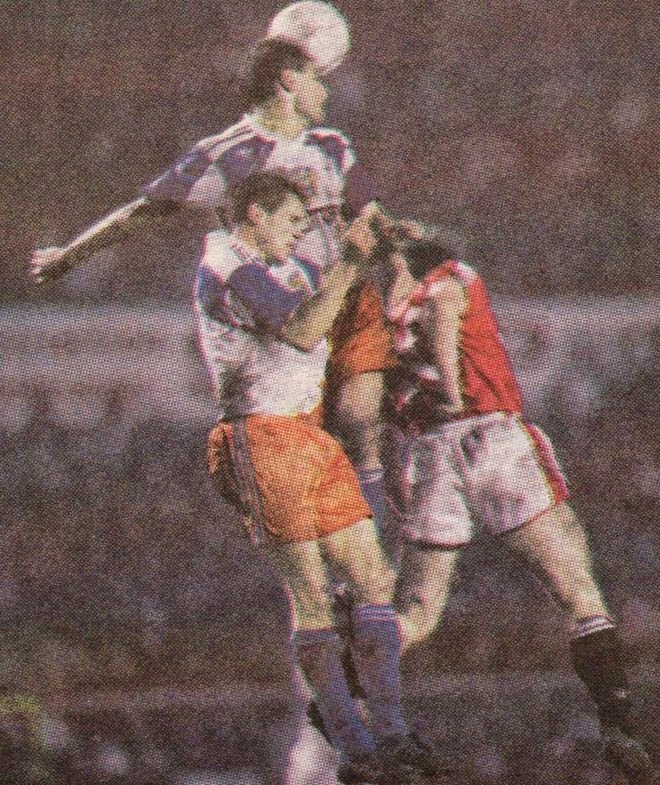 Lee Sharpe attacked from the left side, after a give and go with Hughes, he crossed for McClair to score. But in the 8th minute, Ziober crossed from the left and Martin scored an own goal, even though they were no Montpellier players around him. 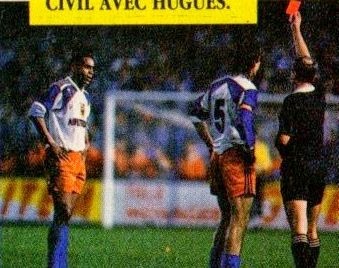 In the 48th minute, Mark Hughes had an entanglement with Lemoult and as he got up, Pascal Baills pushed him and he was sent off. 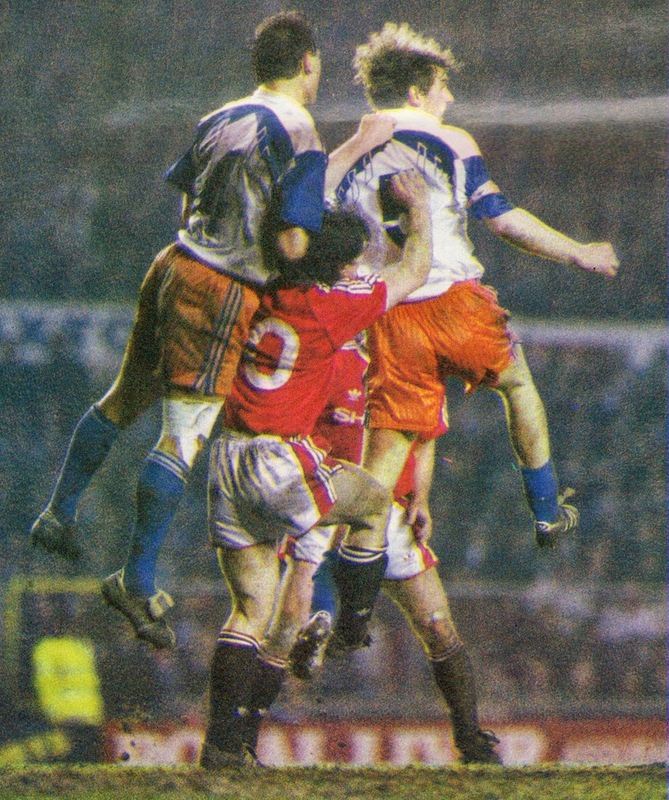 Pascal Baills was sent after Mark Hughes. Manchester United did not take advantage fully of their man advantage at home despite having more chances. Daniel Xuereb nearly snatched a winner for Montpellier towards the end. At this point it seemed Montpellier had the upper hand in the tie, with home field advantage coming up. The second leg, on March 19th, was played at Montpellier’s Stade La Mosson. For Montpellier, Carlos Valderrama was back in the squad. Defender Michel Der Zakarian was out injured; it turned out he had played most of the first leg carrying an injury. Thetis came in his place. Brouard took the place of the suspended Baills. Vincent Guerin learned very late from a letter by UEFA that he was suspended from this match. His booking in the first leg was the second in the competition. The suspensions of Baills and Guerin weakened Montpellier’s right side. 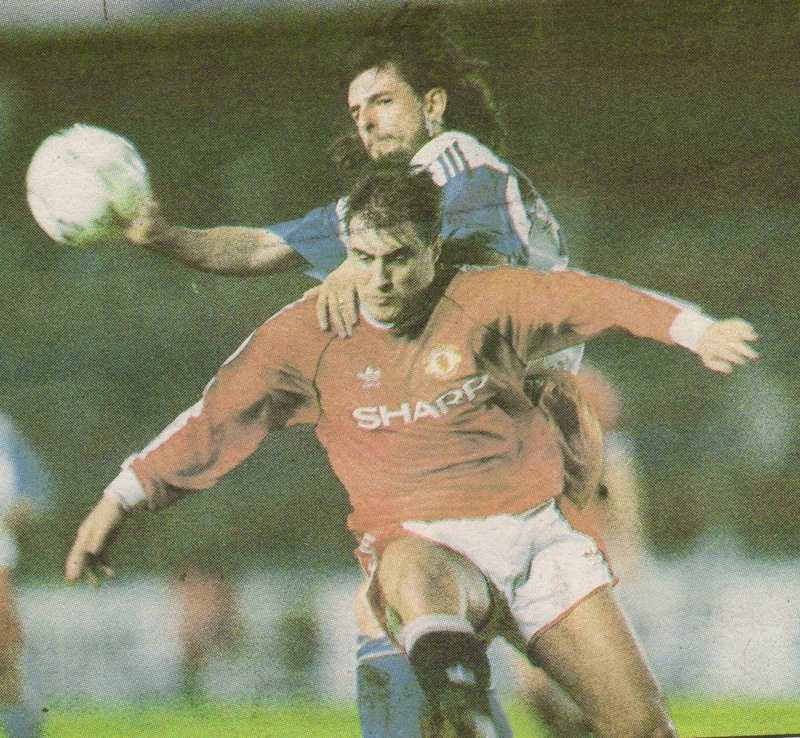 In contrast Manchester United were nearly in full strength as Irwin and Bruce were back in. 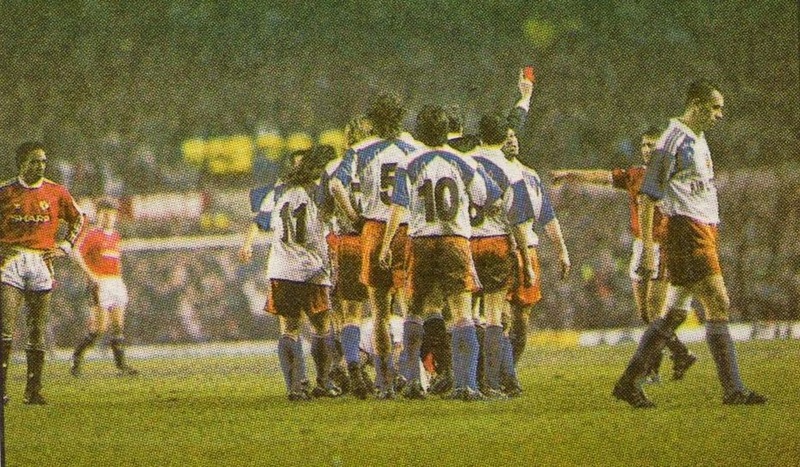 The turning point of this match occurred in the injury time of the first half. Clayton Blackmore’s took a free kick that Claude Barrabe let slip through his hands. 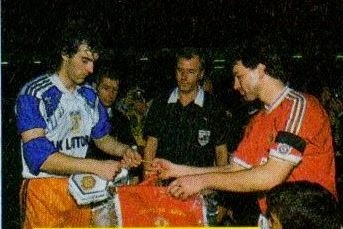 The devastated Barrabe was consoled at halftime by his Manchester counterpart Les Sealey who said ‘I’m Sorry’. Early in the second half, Colleter fouled Blackmore in the penalty area and Bruce converted the kick. Montpellier had no way back and in the entire match had two chances. Thetis also was sent off after an altercation with Hughes. The volatile Montpellier owner Louis Nicollin was absolutely furious with Barrabe after his error and said that he better do his job properly in the League, otherwise he ‘ll return to Reunion (the island that Barrabe hailed from). 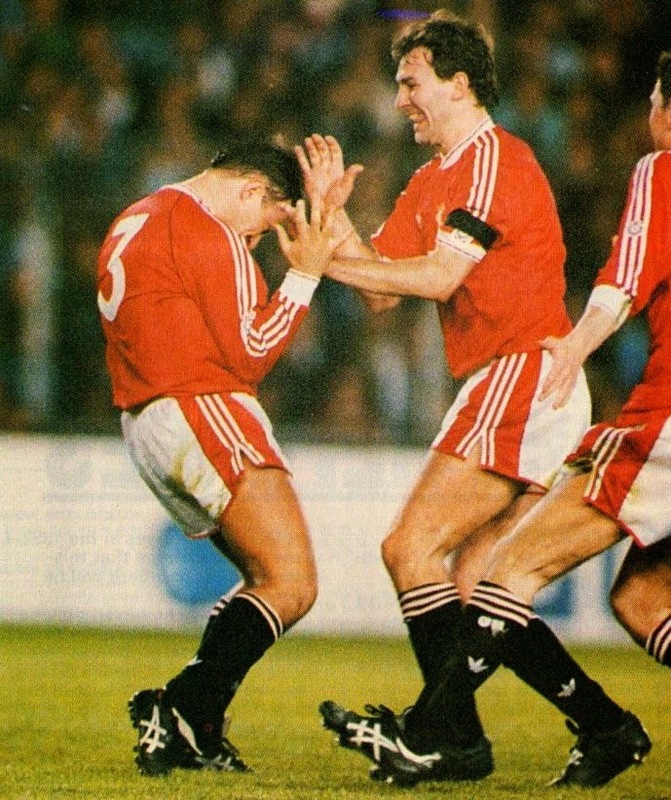 Manchester went on to the semifinals and after eliminating Legia Warsaw met Barcelona in the Final. The triumph over Barcelona paved the way for two decades of unprecedented success under Alex Ferguson.